I am currently frustrated, as it seems I often am, by the current display on our local weather radar. It has been unseasonably hot and humid here in New York City for about a week. 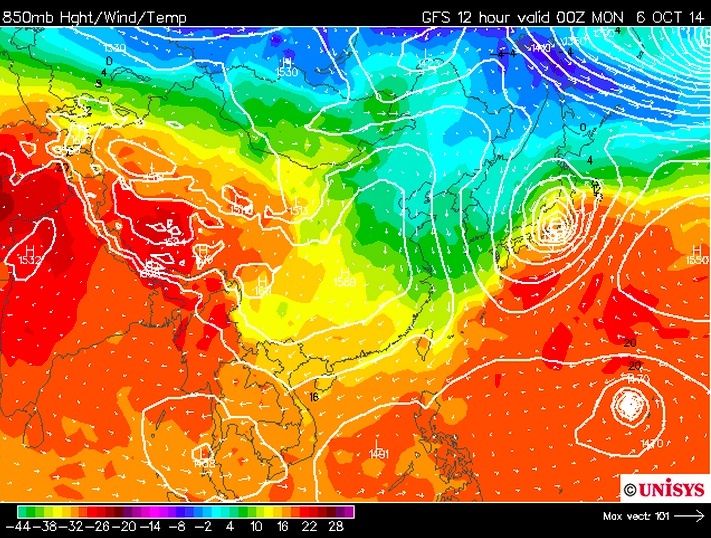 Now, the climax that we residents of the humid eastern US habitually look forward to after waiting through such steamy periods is in sight. 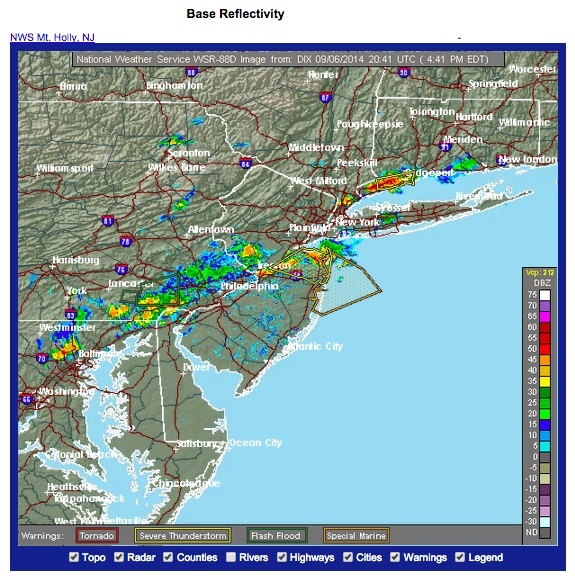 A solid line of thunderstorms (some of them severe) is stretching across Jersey and just south of the city. To get there it had to pass through NYC, but as it did it developed a gap, which we were in. We got jack diddly, at least here in northern Manhattan. The cold front will pass through this evening regardless, and the heat will break – presumably for good, as we head into fall. And there’s a chance of more thunderstorms later. But still, I feel cheated. It’s worth also mentioning that the coolness this summer was limited to our half of the country; the west was extremely hot even compared to recent years, with bad forest fires in the Pacific NW, the drought in California etc. One can’t assign the hot weather today to global warming though – at least not for the most part. It’s never a good idea to attribute a single day of weather to long-term trends, because the natural day-to-day (and even month-to-month or year-to-year) fluctuations are large. On the other hand, it is safe to say that global warming will mean more 92-degree days after Labor Day in years to come, compared to the past. Because of natural variability, some summers are a little warmer, some are a little cooler. But global warming keeps continuously pushing them all warmer. So by sometime in mid-century, the coolest summer in any given decade is still very likely to be hotter than even the hottest summer that anyone alive now (or their parents, grandparents etc.) has yet experienced. Climate Central did a nice piece recently which includes an online form allowing you to see how this summer stacked up against the historical record for many US cities. 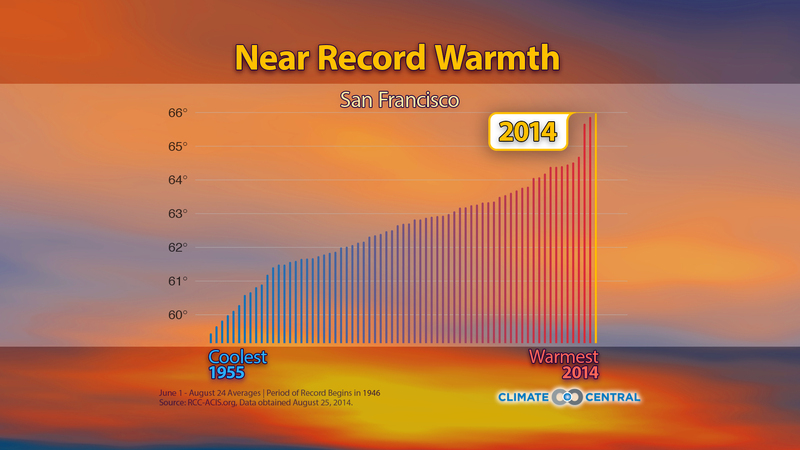 Here is the image I got by selecting San Francisco, where this summer broke the all-time record according to the graph – I’m not sure why the title is just “Near Record Warmth”. The bars are the different years ranked by their average temperature.